The Knights Templar established a preceptory at Kilcloggan on land granted to them by Henry II. 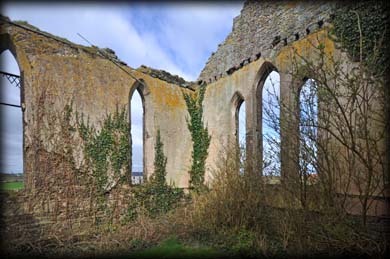 The name Kilcloggan is a corruption of Cill Eallóg – Alloch’s church - which suggests there may have been an earlier church here. After the Templars were suppressed in 1307 much of their property was transferred to their rivals the Knights Hospitallers. 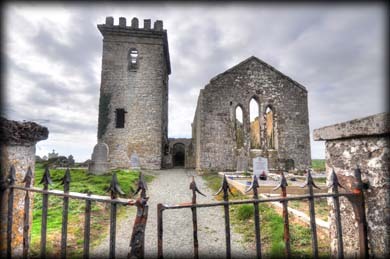 It was the Hospitallers who built the fortified church here in Templetown Parish and the tower house at Kilcloggan. All that remains of the Hospitaller church is the Norman Tower. There are scant remains of the old church to the south of the tower and the ruin of an early 19th century church to the north. Also present is a Knights Templar grave and a bullaun stone. My visit here was a little short hopefully the next one will be a longer. Situated: From Fethard in Wexford follow the signs for Hook Lighthouse. After about 3 kilometres turn right at the crossroads. Then left at the T-Junction. You should see the tower on your right just passed the Templars Inn. Discovery Map 76: S 7555 0361. Last visit April 2015.